SEATTLE (Hypebot) – In the crowded and competitive field of music streaming, Amazon isn't often mentioned, but with the introduction of collections like Amazon Acoustics and the release of its own Christmas album, there are signs Amazon could be the dark horse of streaming. While Apple, Spotify and Google/YouTube get all the hype when it comes to streaming music these days, Amazon Prime is keeping a surprisingly low profile. Everyone who's an Amazon Prime user also gets Prime Music as an added benefit, which is frequently overlooked. While it seems that the online retail giant isn't all that interested in the streaming music business, there are signs that it's not ignoring it either. 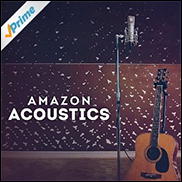 For instance, it just introduced the Amazon Acoustics collection as an exclusive feature for its Prime members. There are 30 recordings available from artists like Joshua Radin, Surfer Blood, Jessie Baylin and Tokyo Police Club that are available via the Amazon Music app on iOS and Android devices, Amazon's connected Echo speaker, or online at the Prime Music website. The company also recently released the Grammy-nominated Transparent soundtrack album as well as it's own Christmas album featuring artists like Liz Phair, The Flaming Lips, and Yoko Ono. Plus it's new Amazon Studios arm just beat out Netflix to put together a show with the Top Gear team to the tune of $250 million. So watch out for Amazon Prime. It's overlooked by many, but it has some muscle to change the dynamics of the streaming music business if it ever chooses to do so.